I've been studying the papers for City & County of Swansea's Special Cabinet Meeting next Tuesday (February 10). As a parent of two school-age children, I have to say it's enough to keep you awake at night with worry. This meeting will decide which proposals go through to the Council budget-setting meeting on February 24. The agenda, for a Labour-led Council remember, is all about parcelling out Con-Dem cuts. For months parents, governors, pupils at my younger son's school have been opposing the proposed sell-off of school playing fields for house-building, along with residents from the local community. We have serious concerns that the Council has barely paid lip-service to the democratic process. Reading the papers reveals that my son's school is one of 14, just in the first tranche of sell-offs of school land. Labour councillors claim this is "surplus land" but the beautifully maintained ground where my son plays, learns and evacuates to in an emergency, is a school playing field and not surplus land! You can check this out for yourself - follow @ParklandsField on Twitter or look up the Save Parklands Field Facebook group. Watch the wonderful video, starring pupils themselves, which demonstrates why a number of Welsh sports stars are now backing the campaign to save the playing field. How many of the other parcels of school "surplus land" are also green spaces valuable to our children's education and development? I knew about this proposal from studying the Council's budget papers last year. Some Labour councillors who voted for the proposals obviously hadn't checked what they were voting for because they told me, when I challenged them on it, that there were no plans to sell school playing fields. The only alternative, that they did know and lied to me, would be even worse! School playing fields are just the tip of the iceberg when it comes to schools and education cuts. Up to now, the Welsh Labour Government and our Council claim to have protected education. In fact, there have been cuts in areas like 'education other than at school' and transport for faith and other schools but education has seen far fewer cuts than many other services. Now however, education will face severe cuts from the Council - £24 million in the next 3 years, 15% of the current budget. In the papers that Cabinet members have received there's a section where head teachers identify what cuts of this scale will mean for their schools. They all predict that it will be impossible to meet the statutory requirement to teach 5-7 year olds in maximum class sizes of 30. Many schools predict class sizes of 42+ for older pupils. All of them will see job losses, which will affect teachers, classroom assistant and support staff. The only response of the Council leadership to these concerns seems to be that schools are 'relatively protected' and other services have it worse. If you work in education or are a parent who's worried about their children's education, join TUSC representatives on the lobby of the Council Cabinet on February 10 and the full Council on February 24 (both from 4pm at Civic Centre). 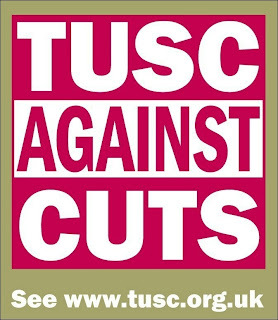 Meet TUSC representatives this Saturday in Oxford Street, from 1.30pm, holding a ballot on whether Swansea people expect our representatives to fight Con-Dem cuts. Press Release: Defend Council Jobs & Services!